A Christian teacher has gone into hiding in the northern Nigerian city of Kano after offending her Muslim pupils. During an economics class, the teacher reprimanded a teenage girl for not concentrating and threw the book she was reading onto the floor. This outraged students as it was a part of the Koran, Islam's most holy book. Police arrived to calm their protests after all the school's teachers fled. 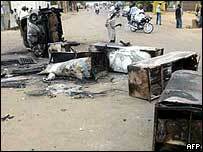 Earlier this year Kano was the scene of bloody anti-Christian riots. Police remain on duty at the Ace Academy secondary school and will do so until the tension eases, Assistant Superintendent Baba Mohamed told the BBC. The name of the teacher, who had only been working at the school for two weeks, is not being released by police. They fear that if people knew where she was, her life would be in danger. According to the BBC's Adow Sale in Kano, an imam at a nearby mosque was able to calm the agitated crowd that had gathered outside the school on Thursday. He pleaded with them to remain calm, our correspondent says. Muslim youths went on a violent rampage in May in protest at the killing of hundreds of Muslims in central Plateau state. School authorities have not said when the co-educational school will reopen.